Hemophilia, an X-linked disorder, is a congenital inherited bleeding disorder of the clotting mechanism cause by an abnormal gene that produces a defective clotting factor protein with little or no clotting ability. The two most common forms of this disorder are Classic hemophilia (type A) which is caused by the lack of factor VIII and Christmas disease (type B) is caused by the deficiency in factor IX. Since both of these disorders are X-linked, the female is the carrier and the disorder is manifested only in males. occur at any part of the body. Hemarthrosis, or bleeding into the joint spaces, is the most common complication of severe hemophilia. The knee joint is the most frequent joint involved. 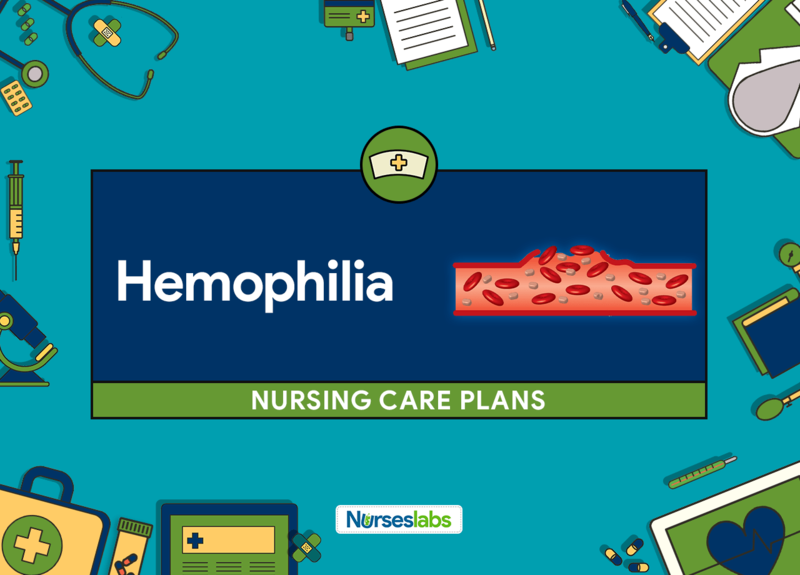 The nursing care plan goals for a client with hemophilia may include absence of complications and pain, prevention of injury and bleeding, improved physical mobility, and understanding of the disease condition and its management. Client will experience decreased pain. Assess the location, characteristics, and rate of pain (use pain scale). Hemarthrosis (bleeding into joint) is the main manifestation of the disease. Common sites include the elbows, shoulders, hips, knees, and ankle joints. ability to move affected limb. Bleeding episodes should be managed at the onset of discomfort, which entails a deficient factor replacement. Immobilize joints and apply elastic bandages to the affected joint if indicated; elevate affected and apply a cold compress to active bleeding sites, but must be used cautiously in young children to prevent skin breakdown. Immobilization promotes comfort and decreases joint damage; elastic bandage most often avoids muscle bleeding; elevation of affected extremity/ joint will minimize swelling; cold application will promote vasoconstriction. Provide bed cradle over painful joints and other sites of bleeding. Prevents pressure of linens on affected sites, especially joints. Maintain immobilization of the affected extremity during the acute phase (24 to 48 hours); apply a splint or sling to the affected extremity if indicated. Immobilization of the affected joint helps to decreased bleeding and provide some relief. Perform range of motion 48 hours after the acute bleeding episode and pain has subsided. Maintains optimal joint movement. Administer medications as indicated. Acetaminophen (Tylenol), propoxyphene, corticosteroids, and codeine are given for pain management; NSAIDs such aspirin are contraindicated since they impair clotting and can cause gastric bleeding. Administer factor VIII or other prescribed factor component immediately. Controls the bleeding that is causing the pain. interventions to relieve it; how medications must be administered via per orem, while injections are not advised; to avoid taking aspirin or aspirin product for pain. Promotes understanding of pain responses and methods to reduce it. Instruct child to support and protect painful areas and in the importance of immobilization. Promotes comfort and prevents further bleeding into joints.